France will create 2,680 extra anti-terror staff, as over 3,000 radical Islamists require surveillance, Prime Minister Manuel Valls said at a Wednesday meeting, revealing plans to boost terror strategies. In the next three years, the number of security agency employees involved in counter-terrorism activities, will be increased by 2,680 people. The funding will be boosted by €425 million.The PM presented the French government’s plans to fight terrorism following attacks in Paris where 17 people were killed. “The number of radicals in the country is constantly growing. French intelligence needs to conduct surveillance on over 3,000 radical Islamists. In particular, 450 people who have previously participated in fighting in Pakistan, Afghanistan and Yemen, and at the moment are taking part in sending volunteers to Syria and Iraq - they account for about 1,300 people,” Valls said as cited by TASS news agency. 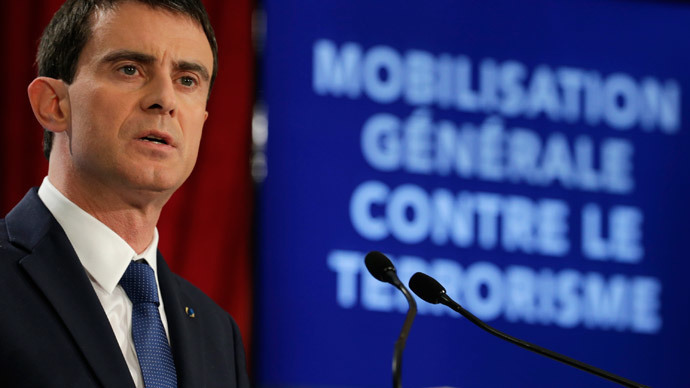 Valls also announced the launch of a special website designed to inform the public on ways to prevent radicalization. On Thursday, Najat Vallaud-Belkacem, minister of education, will deliver details of the educational plan to the nation. French authorities have found themselves red-faced after it was revealed the Islamist extremists who carried out the deadly attacks on the Charlie Hebdo magazine and kosher supermarket, had been known to intelligence agencies, including American, for years, The Guardian reported. Several members of the terrorist network were put under surveillance in 2010, and one Islamist was even stopped by French police in Paris a week before his attack to check his identity documents, but there was no follow-up from the anti-terror police unit. Europe is in a state of high alert after anti-terror raids netted over two dozen arrests. UK police have raised threat level to ‘severe’ fearing attacks similar to the one narrowly averted in Belgium, while Brussels has deployed troops to guard key sites. The security beef-up in Britain to the second-highest level of five comes after a Thursday raid on an extremist cell in Belgium revealed an imminent plan to attack police officers. British authorities say a similar attack may be in preparation in UK, the British media reported.